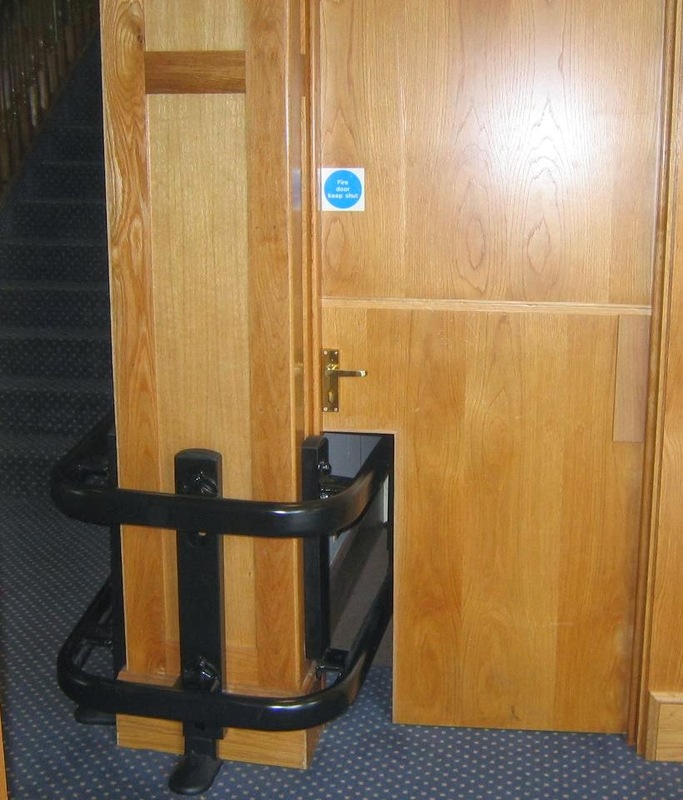 Possibly the worst example of fire door safety in the UK has gained the dubious honour of ‘Dodgy Fire Door of the Year’ from safety campaigner Theodore Firedoor. The photo (left) of a fire door in an undisclosed care home location exposes the worst type of ‘adaptation’. Part of the door has been neatly cut away in order to fit a stair lift, rendering the fire door completely useless. This fire door would offer no protection for the building users and a fire would spread rapidly. 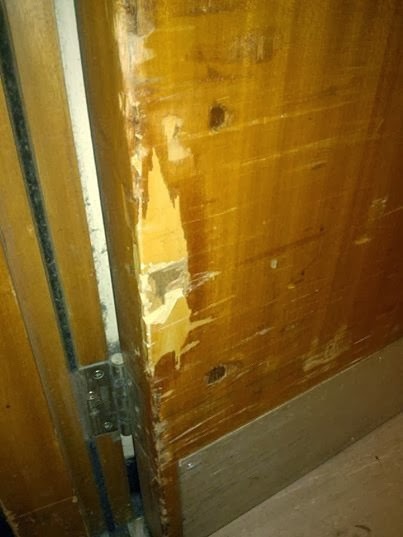 Like this one, more than 40 photos of dodgy fire doors were submitted to the Theodore Firedoor Facebook page last year. As well as the ‘winning’ monstrosity, two badly damaged fire doors in a hotel and a hospital also stood out in the Top 3 most shocking pictures to be received in 2013. 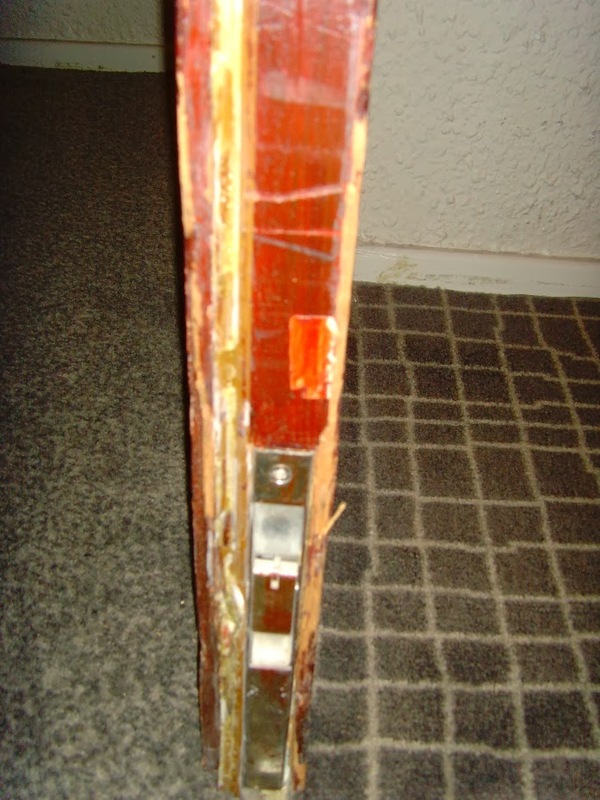 The hotel fire door (below) had sustained repeated damage to the door leaf and was missing any intumescent seal. In the event of a fire, intumescent seals expand and seal the allowed gap between the door and frame. This fire door would provide little or no protection to a hotel full of guests. The hospital fire door (below) had obviously been repeatedly damaged due to the high volume of traffic passing through. It was damaged down to the core; in the event of a fire its effectiveness would be greatly compromised. The Theodore Firedoor campaign was launched by the Fire Door Inspection Scheme (FDIS) last April to publicise the widespread problems of ill-fitting, damaged and poorly maintained fire doors. Theodore Firedoor lives on Facebook, Twitter and YouTube and encourages sharing of dodgy fire door information across these social media channels. His video of appalling fire door maintenance at a city hospital last summer has already attracted more than 2,000 views. In the meantime, the Theodore Firedoor campaign is continuing in 2014 and will publish more pictures of dodgy fire doors. Pictures can be sent in to Theodore Firedoor’s Facebook page www.facebook.com/theodorefiredoor via his Twitter account @Theodore_Firedoor, and his email address theodore.firedoor@gmail.com.